Our team is made up of lawyers graduated from the best US and European universities (including, among others, Harvard Law School, Georgetown University Law Center, ICADE, the Universidad Autónoma of Madrid and the Università LUISS Guido Carli of Rome) and have extensive experience in the leading Law Firms in these regions. In addition, our lawyers are bilingual in Spanish, English, Italian, French and Russian, which allows us to communicate closely with our clients and any third parties involved. 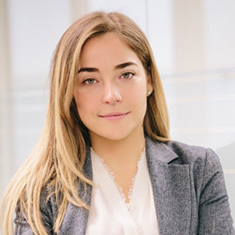 However, none of this would be possible without the leadership and strong professional convictions of our managing partner Lucia Goy Mastromiechele, and the rest of the team. Our relentless pursuit of excellence requires us to count on lawyers with exceptional academic and professional experience.